On the night of June 4, a group of police officers came to a house in suburban Rangoon, searched it and took away one of the occupants. But the person they took is not a wanted robber, murderer or escapee. He is a comedian. 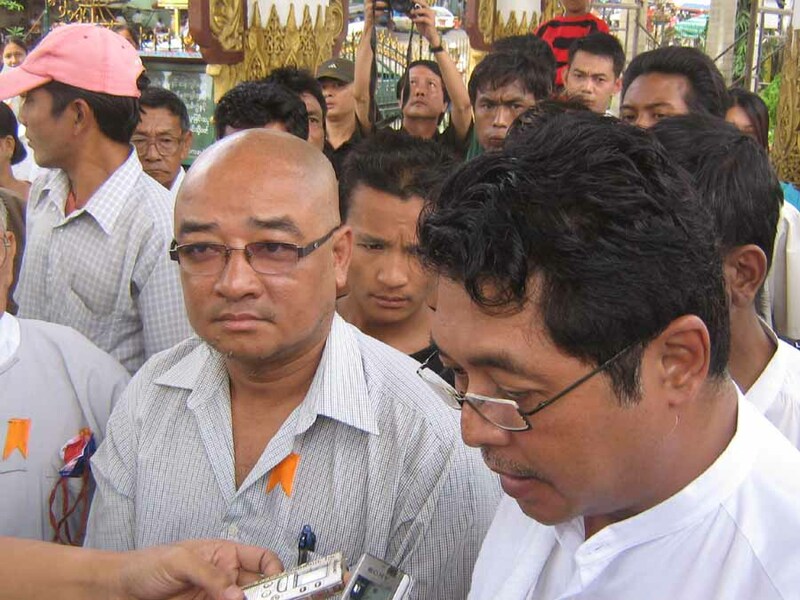 Although Zarganar (pictured above at left, with fellow actor and social activist Kyaw Thu) is famous in Burma for his antics on stage and screen, he has not been joking much lately. Instead, he has been at the front of local efforts to get relief to where it has been needed most since Cyclone Nargis swept through his country a month ago. Zarganar, whose adopted name means “pincers”, has thrown everything into the relief effort, organising hundreds of volunteers in dozens of villages to help in giving out food, water, clothes and other basic necessities to thousands of people. His sister told Voice of America that he had sold his and his wife’s mobile phones to use the money for the work, and that as the monsoon is setting in they had just purchased seeds to distribute in order that villagers who have nothing to plant might at least grow vegetables and stave off hunger. He has also been a vocal critic of the government response to the cyclone, constantly pointing to the shortfalls in assistance and needs of survivors. Yoma 3 says that eight naval craft sunk during the storm although there has been no official comment on this, which has reportedly caused disgruntlement in the navy. The lost vessels were stationed at the Irrawaddy, Pyapon and Bogalay bases, among others. It also says that around 3000 naval families are believed to have had their homes damaged or destroyed in the cyclone and so far there has been no systematic effort to start rebuilding them. As predicted, survivors of Cyclone Nargis, which ravaged lower Burma on May 2 and 3, are no longer surviving. Perhaps because it was intended to deflect censure, this audacious remark didn’t get much notice. That’s unfortunate, because it implies a great deal both about how the junta thinks and how it operates. Where does “only for questioning” fall under the law? If people are arrested, then criminal procedure applies. Police must lay charges and bring the accused before courts. But if someone has not been arrested, nor held according to established practice, then what is there? If the military regime had even pretended to play by its own rules, then lawyers and relatives could have sought access to detainees according to those. If it had declared an emergency or otherwise sought to bypass ordinary law through formal announcement, then this could have been critiqued and campaigned against. But dragging people from streets and houses with the help of assorted thugs and unidentified officers denies all recourse. “Only for questioning” is a blank wall, a legal void, a disavowal of everything.